It’s been a long time since a city has inspired me as much as Berlin. Amsterdam was absolutely fantastic – there was so much to see. Our art-orientated sightseeing ranged from seeing traditional artwork at the Van Gogh Museum to more contemporary works at the Stedelijk, Amsterdam’s equivalent of New York’s Museum of Modern Art (MoMA). However with Berlin, it’s different. You’re not just entering buildings and spaces to look at the art; it’s everywhere. It’s in the buildings, not just physically, but inherently. It’s ingrained as part of the architecture, it’s on the street, down alleyways, on subway routes, it’s even encapsulated by people’s eclectic mix of clothing. The city seems to pulsate with this artistic aura, which threatens to overwhelm you it’s so inspiring. You feel as if you’re going to burst with this creative warmth brewing in your stomach as you take it all in! The history of the place seems to enhance this sense of creative energy, particularly given the fall of the Berlin Wall in 1989. With the fall of the wall, came the fall in both political systems and social barriers. Berlin realized a new kind of freedom that had never been felt before and consequently aspects such as the music scene flourished as people endlessly celebrated the reunification. Given their history it seems people in Berlin have something to say; it’s as if the years of oppression made them realise that they want to be heard. 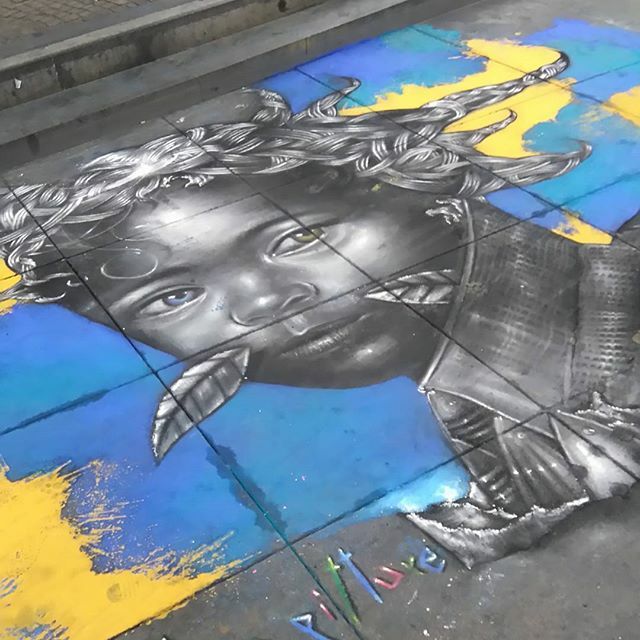 With transient chalk-based artworks on the pavement, alleyways bursting with colourful graffiti, the life and soul of the city can be found anywhere and everywhere. I think this is why it had such an impact on me. The creative culture of the city was not confined to sketchbooks and galleries, or exclusive artistic spaces. Instead it was living and breathing on the street, trickling into the galleries from outside. Walking through this cultural hub that is Berlin really focuses your mind. Because there is so much to absorb, you realise what it is you want to pinpoint and fixate on; what explorations you want to further. I’ve always been fascinated by graffiti, however in the past it was more of a subconscious fascination. It was only as we walked through Berlin and I was catching glimpses of it in places and on the facade of big buildings that I became aware of how interested in it I actually am. Now that I am more aware of this interest I reflect and realise that there have been very poignant moments that fueled my interest in street art. One of those moments was years ago when I was walking behind Edinburgh Waverly station and I came across this wall absolutely crammed with colour and bubble shaped writing, graffiti creatures curling out of the wall. There was someone spray painting and I remember thinking how free they must have felt in that moment. To have no paper or easel, no barrier between their spray can and a permanent site. They were leaving their mark in a space that didn’t belong to them and I thought it was beautiful. Joseph Beuys once said that anyone can be an artist if they realise their potential and find the necessary form in which to communicate their ideas. This sentiment has caused a lot of debate and I am in agreement with him to an extent. However I am more of the belief that art is everywhere. Even though we don’t necessarily see it, or aren’t necessarily looking, it is still present. It’s present in the black polka dots of a lady bug climbing over a green leaf, it’s present in the synced rhythms of our breathing and living bodies, it’s present in the way we gesture as we speak. Art is everywhere and it is the ability to take the things we see; to capture them and their essence and translate them into an entirely new form, that I believe makes you a true artist.